Lord Hanuman is the most worshipped god in Hindu religion. He is the greatest adherent of lord Shri Rama. God Hanuman is the son of Vayu(wind,air), the god of the wind, and his mother is mata Anjana. Once one of saint curst maa Anjana that you will give a birth of a child as a monkey. That time maa Anjana started crying and asking for pardon her suddenly saint was came down and said your son will be a great warrior and will keep his name in this universe forever and will be most powerful man on this universe. When lord Hanuman little grown up one morning, he saw the sun rising and thought it absolutely was an excellent yellow ball. He decided to play with this. It is believed that lord Hanuman is the incarnation of Shiv aarti. Lord Shiva was decided that when lord Rama will be on earth to save this universe that time lord Shiva also decided to came himself as lord Hanuman to help lord shri Rama. The idol of lord Hanuman always can be seen as lord standing or just bowing before his lord Rama and mythical being. 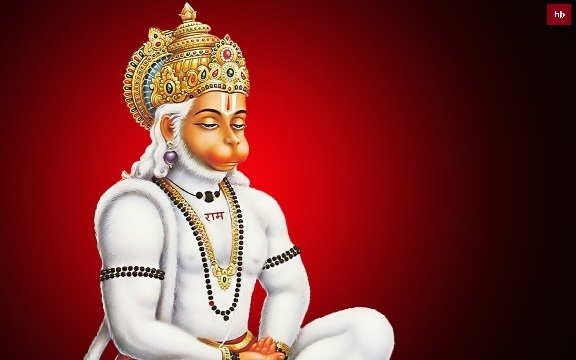 Lord Hanuman has several names like Hanumat, Maruti, Pavan-sut, Pawan putra, Anjaneya. Tuesday is the day of Hanuman chalisa. on Tuesday chanting Hanuman Chalisa in Hindi is beneficial. It is believed that lord Hanuman born on Tuesday. All devotees of lord Hanuman keenly worship on this day. One off famous story that once lord Hanuman saw maa Sita applying Sindoor (Vermillion) on her head then he asked maa why you are using this, with smile maa Sita replied this is just for lord Rama long life. Then god Hanuman thought if a pinch of sindoor can increase lord Rama’s long life, then I have to apply on my complete body. 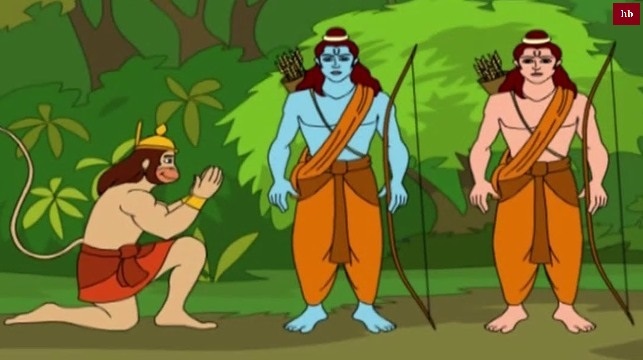 When lord Rama, Lakshamana and maa Sita were sent to jungle(vanawaas) for 14 years lord Hanuman met there with lord Ram.Lord Rama said to lord Hanuman, I am Ram and he is my brother Lakshman. We came from Ayodhya and in search of my wife sita. Sita had been kidnapped by the demons king Ravana. Here lord Hanuman instantly understood that lord Ram is not a normal human sure he is the avatar of god. Lord Hanuman disclosed his identity and bowed ahead of them. Seeing Hanuman’s love towards him Shri Ram placed his hand on his head. Full of outermost joy Hanumanji placed them on his shoulders and took them to Sugriv on the mountain high. Sugriv was elated to visualize Shri Ram and once hearing his story Lord Ram secure to assist Sugriv and reciprocally Sugriva secure to assist Shri Ram notice deity mythical being. Lord Hanuman ji Story is one the most important epic and divine super hero mentioned in Sanskrit literature in Ramayan. He is depicted with a face like monkey and additionally with a tail. Naturally this creates some curiosity to know how lord Hanuman face is like monkey. Did Hanuman ji extremely resembled as a monkey?biggest question ever. As mentioned in some stories, lord Hanuman’s mother was curse by a saint to have son like monkey and when hanuman ji born same as per saint’s curse son was born as monkey. This is the main reason of lord Hanuman images having face like monkey. Devi Anjana who is mother of lord Hanuman, was a pretty apsara or heavenly nymp. One day, she was wandering on Earth once she saw a monkey sage meditating deep at intervals the forest. Anjana could not stand the sight of the solemn monkey sage and burst into laughter. She even created fun of the monkey, and once he neglected her, she threw stones at him. At this, the monkey sage lost his, expressed his deep anger at maa Anjana with a curse. He cursed her. As per old stories, In Sanskrit language "Hanu" means Jaw and "man" ugly thus Hanuman means ugly jaw. If you are in wonder lets read the whole story behind. When lord hanuman was a child he saw the sun and thinking it’s a good ball to play and also thinking it is like something to eat. He took sun into his mouth thus suddenly darkness like night came on the earth. All gods are thinking what has been happened they came to Lord Indra and asked him to help him. After knowing the whole situation Lord Indra used his Vajra on lord Hanuman chalisa in english and cause of this lord hanuman’s jaw broken down and got ugly face. When Hanuman saw Goddess Sita being applying Sindoor (Vermillion) in her hair, he asked the explanation for a similar. Goddess Sita being replied that it had been for long life and well being of Lord Rama, her husband. Hanuman, the most important fan of Lord Rama thought if a pinch of sindoor within the hair will increase the longevity of Lord avatar then why not apply on the complete body. He then applied sindoor everywhere his body for Rama’s long life. Seeing this innocence and unmatched devotion of Hanuman, Lord avatar gave him a vardan (blessings) that whenever the name of devotion takes place, Hanuman’s name are going to be taken 1st. Also, whoever pays relevancy Hanuman on Tuesday, not solely can his/her needs return true however will be pricey to Lord Rama himself. Lord Hanuman is the foremost devoted follower of Lord Rama. Those people, who are well versed within the epic scripture Ramayana, knew the all deeds of Lord Hanuman and his dedicated devotion to Lord Rama. Hanuman helped Lord Rama in searching of goddess Sita, and marched into Lanka to fight, saved Lakshman's life and helped rescue goddess Sita. Lord Hanuman is very powerful he is able to resize his body according to the situations. Some stories say that lord Hanuman was powerful that he may have freed ma Sita. He has strongest body on the earth like todays super heroes superman, Batman, etc. Every god in hindu religion has their own idol and image for their deities. Lord Hanuman and his army helped lord Rama to reach lanka for this they developed a bridge between India and Srilanka on the ocean. This bridge is the biggest human made bridge in the world. This bridge known as Rama Setu. This bridge is still visible from space. Lord Hanuman burnt Lanka. It is said the whole Lanka was built of pure gold and Ravana was the king of this Lanka. Once in the battle of Ramayana, son of Ravana Meghanath used Shakti baan to kill Lakshman and wounded him the life of Lakshman was in danger. For this lord Hanuman went to bring Sanjinvani Buti from mountain Himalaya, there lord hanuman was confused to choose which one is Sanjinvani Buti then he carried out the whole mountain and saved Lakshman’s life. Ravana has aggravated Lord Rama by carrying away his beloved Goddess Sita being so as to start out a war. Throughout the epic times that follow, Lord Hanuman brings hope and secret messages to the captive Goddess Sita being, leads Rama's monkey army within the Battle of Lanka and single-handed kills several demons together with Lankini, champion of the demons. throughout this point Hanuman is captured by the enemy, solely to outmatch them with crafty and also the use of his powers. He returns to search out Lord Rama and his brother Lakshmana themselves captured by the enemy and on the point of be sacrificed to the god Kali by the magician Mahiravana. during a tale of nice daring, Hanuman outsmarts the evil lord into turning into the sacrifice himself, thereby earning the eternal respect of Kali. She appoints Hanuman as her doorkeeper and nowadays several of her temples area unit seen to possess a monkey guarding their doorways. During the battle Lord Rama and Ravana, Hanuman not solely kills many demon generals however conjointly brings Rama's brother back to life, however will he do that? Well, it thus happens that Rama's brother is mortally wounded by Ravana's son, and also the monkey-army-physician opines that the sole things that may save the lifetime of the younger patrician area unit four specific herbs that grow on the range of mountains slopes. The catch? The battle is raging on in Lanka, across the southmost tip of the country whereas the mountain chain area unit way up north, and also the herbs area unit required among consequent few hours, before the new day dawns. Hanuman leaps up into the air, flies in the north at lightning speed, and alights atop the mountain chain. This can be wherever things begin to become confusing: the monkey-physician had same that drugs herbs glow in their own lightweight which it ought to be simple, therefore, to identify them. What Hanuman sees, however, is a whole mountain bright with herbs of all types, every emitting its own peculiar lightweight. Being unable to spot the precise four herbs that the vaid had delineated , Hanuman uproots the whole mountain and carries it back to the field. The vaid gets his herbs, the near-dead patrician is brought back his life, and, thus sturdy is that the impact of the mountain abundant with thousand musky herbs that alternative monkeys who had fallen in battle are well simply by eupneic the medicine-scented mountain air. This is the day when early within the morning we tend to celebrate the birth of 1 of the great devotees of Lord Hindu Lord Hanuman. Lord Hanuman is a great adherent of Lord Rama and helped Lord Rama to rescue Goddess Sita being Hindu deity from the demon king Ravana. We celebrate his birth by conducting Guru puja, Kalash puja, Yagna and Abhishekam to Lord Hanuman. we celebrate the glories of Lord Hanuman by singing the Hanuman Chalisa in many designs throughout the celebration along side alternative Hanuman Bhajans. Everyone seems to be most welcome in the aarti and pooja of lord Hanuman. On this birth day of Lord Hanuman, it is time to become alert to your senses and observe discipline. Train your senses so they assist you devotedly follow your life purpose or Hindu deity. Lord Hanuman, in his incarnation as Panchmukhi Hanuman, destroyed the 5 lamps in 5 totally different directions to kill Ahiravan. Again, the 5 lamps symbolized the 5 senses. Mastering these 5 senses through the management of breath (pranayama) or through meditation, mantra singing and sporting of the fourteen mukhi Rudraksha helps one attain self-control, information and power, whereas adhering to one’s life purpose.